We’ve got what appears to be a clash of the titans on tonight’s episode. How will things pan out? Our rightmost competitor tonight is a beast over at LearnedLeague; unfortunately, Jeopardy! is an entirely different animal. He’s out of contention, but Nikhil’s still in it. Do you know what happened on this date in 1397? It could be part of this Final Jeopardy! clue! This has been a really easy week for me, I gotta say. If Nikhil doubles his score, he’ll have 20,400. 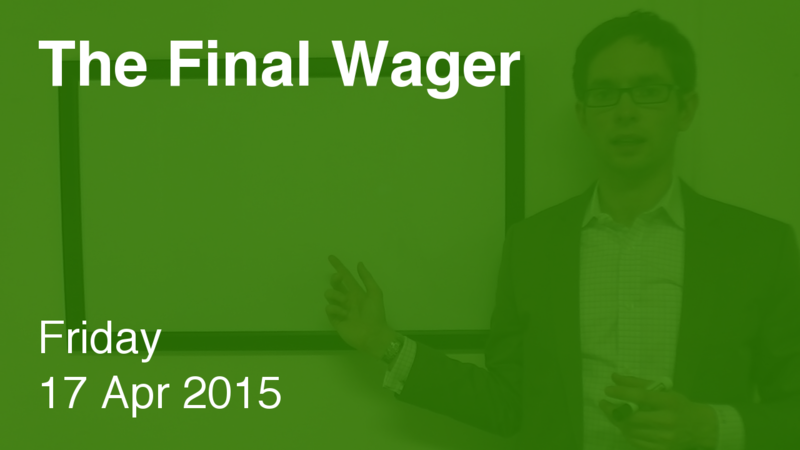 To cover this all-in wager, Alex will need to wager 3,000. An incorrect response with that wager will leave Alex with 14,400. To get above his total, Nikhil must wager at least 4,200. A successful doubling will put Scott at 7,200. Alex could wager at most 10,200. I’d probably cap it at 7,200 so as not to fall below Nikhil on the off chance he wagers zero. We’ll see Mr. Jacob again on Monday as he goes for number seven. Have a great weekend! Amazing fact! The day you got the call was actually also the day my son was born. Long time ago, when Jeopardy! had a “Ken Jennings” set. 8 YEARS AGO! Congrats to Kerry and Alex for breaking what has to be a record!